Learn what the most important measurement properties are and get the definition of your measurement properties clear with our consensus-based taxonomy of measurement properties. A measurement property is a quality aspect of an instrument, i.e. reliability, validity and responsiveness. Each measurement property requires its own type of study to assess it. In the literature different terminology and definitions for measurement properties are continuously being used. Different uses of terminology can lead to confusion about which measurement property is assessed. Differences in definitions may lead to confusion about which concept the measurement property represents, and how it should be assessed. The COSMIN initiative developed a taxonomy of measurement properties relevant for evaluating PROMs. In the first COSMIN Delphi study, conducted in 2006-2007, international consensus was reached on terminology and definitions of all included measurement properties in the COSMIN checklist. This taxonomy hold also for other types of outcome measurement instruments, such as clinician-reported outcome measures and performance-based outcome measures. The COSMIN taxonomy of measurement properties, based on international consensus, is presented in Figure 1. It was decided that all measurement properties included in the taxonomy are relevant and should be evaluated for any measurement instrument used in any application. In the COSMIN taxonomy three quality domains are distinguished, i.e. reliability, validity, and responsiveness. Each domain contains one or more measurement properties. The domain reliability refers to the degree to which the measurement is free from measurement error, and it contains the measurement properties internal consistency, reliability, and measurement error. The domain validity refers to the degree to which an outcome measure measures the construct it purports to measure, and contains the measurement properties content validity (including face validity), construct validity (including structural validity, hypotheses testing, and cross-cultural validity\measurement invariance) and criterion validity. The domain responsiveness (contains only one measurement property, which is also called responsiveness) refers to the ability of an outcome measure to detect change over time in the construct to be measured. It refers to the validity of a change score, and it distinguished from validity in the taxonomy for reasons of clarity. Consensus-based definitions of all included measurement properties are presented in Table 1. A measurement property is a quality aspect of an outcome measure. Each measurement property requires its own type of study to assess it. 1 Content validity is considered to be the most important measurement property because first of all it should be clear that all content (e.g. 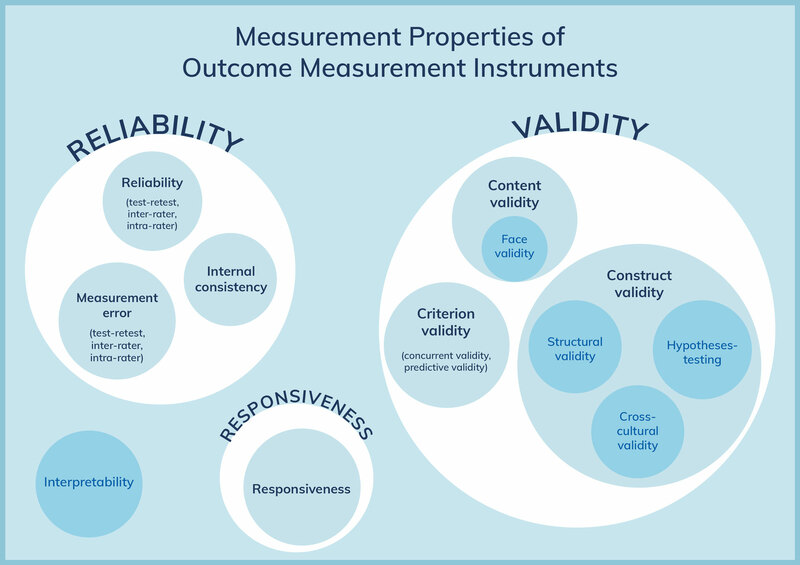 items, tasks, observations or parameters) of an outcome measurement instrument is relevant, comprehensive, and comprehensible with respect to the construct of interest and target population. 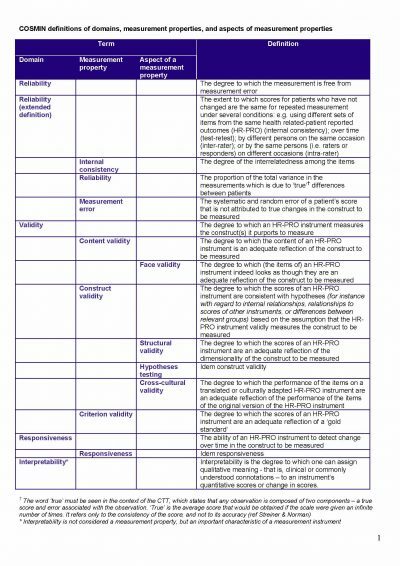 2 Next, we consider the internal structure of an instrument to be important, including the measurement properties structural validity, internal consistency, and cross-cultural validity\measurement invariance. Internal structure refers to how the different aspects (e.g. items, tasks, observations or parameters) in an outcome measurement instrument are related, which is important to know for deciding how these aspects might be combined into a scale or subscale. Evaluating the internal structure of the instrument is relevant for outcome measures that are based on a reflective model. In a reflective model the construct manifests itself in the aspects, i.e. the items or tasks are a reflection of the construct to be measured . Its counterparts is a formative model, in which the aspects within an outcome measure are not supposed to be correlated. Analyses on the internal structure of outcome measures based on formative models can be ignored. 3 Finally, the remaining measurement properties are considered important, i.e. reliability, measurement error, criterion validity, hypotheses testing for construct validity and responsiveness. Mokkink LB, Terwee CB, Patrick DL, Alonso J, Stratford PW, Knol DL, Bouter LM, de Vet HC. The COSMIN study reached international consensus on taxonomy, terminology, and definitions of measurement properties for health-related patient-reported outcomes. J Clin Epidemiol. 2010 Jul;63(7):737-45. doi: 10.1016/j.jclinepi.2010.02.006.